The Mystery of Moral Authority now published! 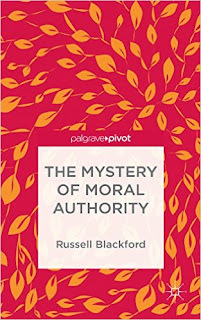 My new book, The Mystery of Moral Authority, has now been published by Palgrave Pivot, bearing an official publication date of 2016 (although Kindle copies, have been available for about three weeks now). This is a short monograph of about 45,000 words. That's not a long read, but it's long enough for me to explain my positive views about the nature and role of morality in a reasonably complete way. In a book of that length, I can't discuss every possible objection to my views or every prima facie plausible alternative to them, so I don't claim that this is a comprehensive account of moral philosophy. It is, however, sufficient to show how the various parts of my thinking fit together - something that I've never done before in one place. Writing The Mystery of Moral Authority also forced me to identify gaps and vagaries in my thinking, discuss counterarguments, deepen my understanding of the field, and modify my initial views (at the time I started writing) as needed when I followed arguments where they led. Although it's not a comprehensive account of the entire field of moral philosophy, I do think that it would make a good undergraduate textbook - not an entirely orthodox one, of course, given how sceptical I am about most existing moral theories. It would at least be a good supplementary text to read alongside one of the widely used texts, such as the popular James Rachels book, Elements of Moral Philosophy. Also, though I do argue for a particular thesis, I try to be more careful and fair to rival positions than is often the case. I don't think anyone who supports one of the positions that I criticise could get the impression that I'm going out of my way to distort and strawman them. I've taken much care to produce a scholarly book - and particularly to understand, and convey to readers, what is strong or attractive in rival positions. Any misunderstandings or dubious selections of material to critique (and there are bound to be some questionable decisions with such a book) are inadvertent, rather than chosen for rhetorical reasons. The Mystery of Moral Authority will be interpreted as a defence of moral error theory - and in a sense that's correct. Note, however, that it's a defence of my own form of error theory, which is a relatively weak one ("weak" in the sense of not making statements that require some kind of extraordinary evidence or argument to support them). It's not the moral error theory; it's my sceptical, pragmatic account of morality. The key set of points that I argue for are that human beings need moral systems, that they amount to a kind of social technology, that they cannot take just any form if they are to suit widespread human purposes (and in that sense they are not merely arbitrary), but that, as a fact of history, they are rationalised by societies, cultures, religions, etc., on various false bases. The result is that much of our moral language is not literally true. On the other hand, we do have considerable resources to say that some moral systems (and some particular moral norms) are better than others. What we can't say, I believe, is that there is one true moral system. For more, you need to read on in the book itself. I don't have a simple thesis beyond the italicised sentence in the previous para. That sentence gives the idea, but it needs to be explained further by reading at least a good chunk of those 45,000 words of text. I hope some readers of this blog will take me up on that. My previous post focused on my own experience of 2015, mainly from the viewpoint of how my work agenda panned out (though I did also mention family issues). I keep private matters fairly private, but I'll just say that I appreciate the support that I've had from so many loved ones, friends, and colleagues through 2015. It's much appreciated, and I couldn't be doing any of this without you. I suffered a mild but persistent illness through several weeks over the winter, which didn't make my efforts during that period, when I was under work pressure, any easier. For a while, I had an annoying dose of conjunctivitis on top of it. I've also been dealing with a couple of other minor health issues in the past month or two. Hopefully, those will soon be behind me. Generally speaking, I'm in good health despite not exactly getting any younger these days, so I'm looking forward to a few productive decades yet. Fair, useful cultural criticism should display some humility in the face of art. It should be grounded in an understanding of context and the relevant styles and traditions of expression. If we propose to engage in critique of cultural products, we had better show some complexity and generosity of response. That is how we earn our places in serious cultural conversations. More generally, there is at least a broad sense in which I belong to the political Left. If I were in charge of a nation's economy, I would seek workable but effective means to redistribute income and assets, try to compress the current huge inequalities of wealth, provide a strong socio-economic safety net, and generally advance the opportunities of those classes who are financially least advantaged. In philosophical theory, I'd not even rule out (plainly, genuinely) socialist approaches; but in real-world politics, I'm very much a pragmatic social democrat. You could vote for me without worrying that I'd scare the horses! My model would be Australia's (generally) successful Hawke-Keating ALP governments of the 1980s and early 1990s. And meanwhile, no one should doubt where I stand on such hot-button social issues as gay rights and women's reproductive rights - both of which I've supported strongly over the years, privately and publicly. But while I am of the Left in a broad sense, I'm not prepared to accept every bizarre ideological outgrowth of identity politics, every propagandist catchphrase that becomes popular ("check your privilege", "Islamophobia", "safe space"), or every attempt to "call out", shame, and otherwise harm some poor individual of whom the self-righteous make a public example (usually for some minor, dubious, or imaginary transgression, or for some moderate dissent from a local party line). It's clear that there are regressive tendencies within the Left, especially within its academic and cultural manifestations. They include the kind of anti-science nonsense famously satirised by Alan Sokal in the 1990s. Though wounded, this form of weirdness has not completely gone away. Among other regressive tendencies, there's too much solicitude on the Left toward religion: the kind of solicitude that leads to perfectly rational criticism of religious faith being labelled as "strident" (however mild it might actually be in tone), and that has made criticism of Islam and Islamism almost taboo in many left-wing circles. Often, too, there's a distasteful paternalism and authoritarianism within the contemporary Left. Such concerns led me to republish (in slightly abbreviated form) my 1999 essay, "The Left's Defection from Progress", which deals with at least some aspects of the academic and cultural Left's tendency to abandon Enlightenment ideals. Seventeen years later, I would probably write this essay in a slightly different way, partly because my own thinking has developed in that time - how could it not? - and partly because the issues have evolved. Still, I think I was seeing something important and troubling in early 1999. I saw an escalation of problems in about 2011 - particularly a sudden acceleration in what came to be termed call-out culture, as left-wing rage bloggers and Twitter mobs became aggressively unfair, intolerant, and savage in going after their own philosophical and social allies. This trend has only grown worse, but in 2015 it was finally acknowledged as a problem by mainstream progressive journalists. I expect that I'll be spending much of 2016 writing about these sorts of issues. The Left's ongoing regressive tendencies have the effect of silencing many decent, progressive people: men and women who are justifiably afraid to offer commonsense views on a wide range of topics, from the role of religion to bioethical decisions and policies. In recent years, many individuals have confided in me about aspects of this, and why they keep a low profile on various topics. They fear being "called out", ostracised, damaged in their careers, etc., by others whom they regard as their own people. As a result, sensible liberal views from more-or-less left-leaning thinkers are often not receiving their due weight in public discussion, creating something of a vacuum. But the other effect is that this sort of nonsense tends to bring the Left as a whole into disrepute with ordinary citizens and electors who are not academics, journalists, etc., making it all the more difficult to oppose genuinely irresponsible and dangerous figures on the political Right. It would be hyperbole to blame the Left for the extreme turn that we've seen of late, with near-fascist opinions and policies being espoused by many current Republican candidates for the US presidency. Doubtless, many factors are involved. It surely can't help the cultural mood, though, when the range of intelligent voices on the Left is restricted by the ideology, propaganda, and sheer cruelty that characterises so much of the Left these days - especially as manifested in the social media and on many university campuses in the US and UK - and when so much left-wing thought appears illiberal, nitpicking, or simply incredible. Let's hope that we get through 2016 with some success in pushing back against these unfortunate tendencies. I'll continue to criticise ideologues and propagandists. I'll oppose rage bloggers, college crybullies, and virtue-signalling Twitter mobs. Above all, though, given what's at stake globally, I also hope that the US manages - at election time later in 2016 - to choose a president who is not one or another kind of dangerous clown or loose cannon. The year just passed was not an easy one, partly because of ongoing family concerns (many baby boomers will immediately sympathise; so many people in my age group currently have serious worries over how their elderly parents are faring). It also turned out to be an extraordinarily busy year in terms of the sheer number of hours I found myself putting in per day and per week. That is partly to do with the intensity of the work needed to complete my new book from Palgrave Pivot, The Mystery of Moral Authority, and get it through the whole process of acceptance and publication. Although it's only a short monograph (about 45,000 words), and I thought I knew what I wanted to say, I found myself going increasingly deeply into the issues, researching aspects to an extent that I wouldn't have thought necessary when I started. It is much stronger for this, but the experience reaffirmed an old lesson about the way a large piece of writing, such as a book, can change once the arguments must be hashed out in actual words on the page and with full rigour. Often, new issues have to be explored to solve the intellectual and literary problems that arise. I delivered the full manuscript in late June, it received an acceptance in September, and it then moved quickly through the publication pipeline (with all that involves!) to publication in December. Another large part of my time has been devoted to editing The Journal of Evolution and Technology. In my role as editor-in-chief, I am the main person involved from day to day, and we've found ourselves somewhat overwhelmed in the past 12 months. There have been many submissions, and many of those have been lengthy, complex, and (for one reason or other) challenging to assess and/or edit. This is rapidly becoming pretty much a half-time workload for me in itself - and though I give every submission much care and attention, I have to work around other projects (I edit JET on a purely honorary basis, so it's not something I can treat as a day job). The JET workload became sufficiently overwhelming in the second half of the year that we actually closed to submissions for the last four months of 2015, enabling us to take steps try to catch up with the backlog. Unfortunately, there is still a backlog to deal with, but the situation is far closer to being under control than it was back in August. We've been able to complete two strong issues in 2015, adding up pretty much to the equivalent of a full-length edited book on topics related to emerging technologies and the human future. There will continue to be challenges for JET in 2016, but it's obvious from the material I'm currently working on that we will be able to complete another strong issue in the next few months. I continue to write for The Philosophers' Magazine, Free Inquiry, and New Philosopher. I also took up an invitation to join the new Cogito philosophy, hosted by The Conversation. As we go into a new year, I am working with my friend and sometime mentor, Damien Broderick, in editing Philosophy's Future: The Problem of Philosophical Progress. This book is under contract to Wiley-Blackwell, and we have a formidable cast of contributors. I expect the intense period of editing submissions to keep me (and Damien) busy until late March. I am also contracted to write a book for Springer (Science Fiction and the Moral Imagination) and another for Bloomsbury Academic (The Tyranny of Opinion). I've been actively planning and researching these, and I'm looking forward to the actual writing process. These are exciting projects. Looking back, the highlight of 2015 from a career point of view was, of course, the completion, acceptance, and publication of The Mystery of Moral Authority. There have, however, been many smaller highlights. Cogito has given me a new (and substantial) audience, and I'm very pleased with some of my posts there. See, for example, my comments on the kerfuffle over bioethics generated by Steven Pinker, my statement on "Why I still support Charlie Hebdo", and my firm position on how we can support the people we don't want to stand with (such as fanatical anti-abortion campaigner Troy Newman). I was especially pleased when the "Charlie Hebdo" piece was picked up by The Conversation's annual selection of contributions - this year's "yearbook" volume entitled Politics, Policy & the Chance of Change. There have been many other small highlights for me. A recent one was the publication of an op-ed for Policy Forum on CRISPR-Cas9 and gene editing. This is a very important emerging issue, and I expect to have much more to say about it in the future. It relates closely to the subject matter of my Ph.D dissertation and to my book based on it, Humanity Enhanced. There's much more that happened at my end in 2015, including other publications, conferences where I spoke, and on and on. That, however, is enough to give the flavour of a busy year. I expect that I'll need to write a separate post to reflect on 2015 itself, as opposed to what it demanded of me. Meanwhile, have a happy 2016 - may it be successful and productive for us all, with a good mix of fun and love! I'll probably repost the whole thing when I get a minute (the code is not completely, um, compatible, so it always takes a bit of time to get it right). Meanwhile, here's a link to my new 2500-word Cogito piece on accommodationism: a kind of a review of Jerry Coyne's new book, Faith versus Fact. I say "a kind of" because it's more than just a review. The release of Jerry's book is also a prompt to reflect on and restate some of my own non-accommodationist, or anti-accommodationist, approach. For anyone who has previously missed it, I link in the piece, and will also do so here, to my detailed dissection - first published in 2000 in Quadrant magazine - of the problems with Stephen Jay Gould's NOMA principle. It was the lead piece in Quadrant on that occasion, if we go by the cover. That's evidence of the way Paddy McGuinness, the editor at the time, was prepared to publish good-quality but risky material (given that his audience was mainly right-wing and often religious). The accommodationism wars in the blogosphere, circa 2010, were all about whether it was okay to express an anti-accommodationist position publicly - even in a civil and thoughtful way - or whether this was too politically inexpedient to be allowed. My view from back then, from even earlier (as with the Quadrant article), and even now, is pretty obvious.